Answer: We would recognize a signal based on two criteria: it would contain non-random information (unlike static), and it would arrive in a narrow band of the frequency spectrum. That’s what our radio signals look like. Mathematical methods can distinguish between random signals and those that contain information. Both those criteria were met by the infamous “Wow! signal” received on August 15, 1977. Alas, it has never repeated or been decoded. Still, recognizing a signal is the easy part, and computers handle all that processing these days. Civilizations capable of engaging in a conversation would have, at minimum, a technology level able to utilize radio waves for communication. Laser light is another potential channel for interstellar communications. But if they’re very much more advanced, they could be using a communication technology we don’t have yet — such as beams of neutrinos, gravitons, or (still-hypothetical) tachyons. These civilizations would necessarily have a knowledge of mathematics and physics. It doesn’t really make any difference how advanced they are relative to us. This would be a shared knowledge. The symbols and equations would look different, but the laws of physics and mathematics are universal. They would probably also have computers (though it took Earth close to a hundred years to advance from radio to computers). So they would understand binary numbers. That would be true even if they had advanced to quantum computing. And a strong case can be made that, even without computers, they would understand number systems with different bases purely from mathematics. Thus, we expect any message would be encoded in binary, since it’s the least arbitrary of all possible base choices. This is exactly what we did when we sent our first message. Take a look at the main graphic at top. This was a message beamed toward the globular cluster M13 in the constellation Hercules on November 16, 1974. It was sent by the Arecibo Radio Dish in Puerto Rico. This instrument is officially referred to as the Arecibo Observatory, since it is usually used for receiving radio waves. But in 1974, it was “run in reverse” and used to transmit a radio signal at a power level of 100 kW, frequency of 2380 MHz (wavelength = 14 cm), and bitrate of 10 baud. It took about 3 minutes to transmit. The signal, which has come to be known as the “Arecibo message,” will take 25,100 years (traveling at the speed of light) to reach M13, a cluster containing around 300,000 stars. So if “they” responded immediately we’d get an answer in the year 44974. Obviously, this was not an attempt to start a conversation. 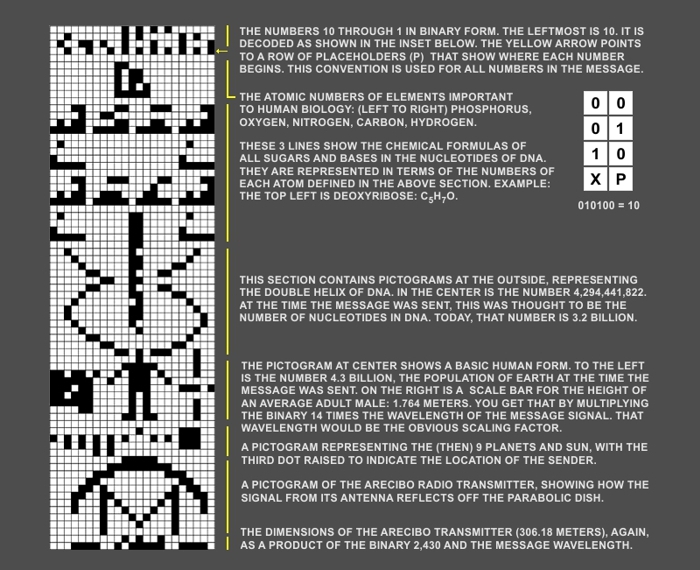 The Arecibo message was simply a “proof of concept” demonstration announcing our presence in the cosmos. And it was a challenging exercise in anticryptography, attempting to convey its intelligent origin while limited to a small number of bits. The message was composed by Frank Drake, early proponent of SETI, with the assistance of Carl Sagan. The message consisted of a series of 1679 binary digits (ones and zeros) and took around 3 minutes to send. Turns out that 1679 is the product of two prime numbers: 73 x 23. There’s the anticryptography at work. This message begs to be arranged in an array, and is suggestive of intelligent content. You might ask: What if it was decoded into a 23 x 73 array instead? Click on the thumbnail below to see what that would look like. The dearth of interesting patterns or symmetries is striking in contrast to the 73 x 23. We think that feature would be recognized. And we assume all left-right, up-down, mirror image, and rotational decodings would be looked at. The intent here was not so much to convey any real practical information. This message, once recognized as of intelligent origin, would in and of itself convey an important truth: You are not alone in the Universe. Scientists and philosophers have long pondered the question: Are we alone in the Universe? That’s what motivates SETI researchers to keep listening. 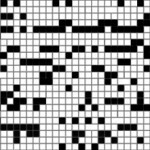 We’ve sent 11 additional signals since the Arecibo message (13 if you include the Pioneer plaques). Interestingly, Earth leaks sufficient modulated radio energy (mostly radar) into space to be “visible” from hundreds of light years (using our receiver technology). And there’s thousands of stars in that range. And as we have learned, most stars have planets. But SETI has been mostly listening. At many frequencies and in many directions. Anticryptography protocols are assumed for deliberate signals — as opposed to modulated leakage, which is also looked for. Our signal amplifiers continue to improve, as well as computer processing power. SETI researchers have differing opinions on how long it might take to discover an intelligent signal. Some say we are awash in signals right now, but just not listening correctly. Some say we could receive it tomorrow. Others say maybe next century. It really depends on what numbers you assume for the Drake Equation. But SETI researchers believe ET is out there somewhere, and have dedicated their careers to testing that hypothesis.